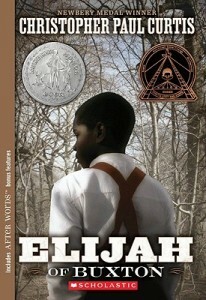 This stunning work of historical fiction should be on any reading list for studying the aftermaths of slavery. In this skillfully written children’s book, we see the world through the eyes of a freeborn child, whose parents had been slaves. He grapples with their rules and views about freedom and education, something he takes for granted. Then, in a very climactic ending, young Elijah comes face to face with the unbearable realities of slavery and slave trade, and understanding dawns. I became a fan of Christopher Curtis after reading Bud, Not Buddy, which won a Newbery Medal. I find Elijah of Buxton equally worthy. Curtis based this children’s book on an historical settlement called Buxton, located in Canada, founded in 1849 as a refuge for freed and escaped slaves. The descriptions of life in the settlement, and the counterpoint of the journeys to freedom, are riveting and fascinating to read. As with Curtis’s other books, his use of dialect in the writing is outstanding. There are many moments of drama, moments where you want to tell Elijah, the hero, he’s making a mistake, but instead we have to witness his learning and growing. There are several unfortunate and tragic events, especially the scenes with the captured slaves. I admittedly had to skim over details as I have very little inner capacity to read such distress. However, it is urgent that the truth be shared with children, and this children’s book does nothing less than share the realities. A fine children’s book to read as a class or at home, or for homeschooling children. While the publisher lists the ages at 8 to 12, I think it is most suited for 12 and older. For an author biography for children, check out Christopher Paul Curtis.